FROM THE RECTOR On 26th May the funeral of Audrey Ruane took place in Foxrock Church. Audrey was the assistant Matron in Kiltipper Nursing home. She asked that I take part in her funeral mass, which I was honoured to do. Audrey generally wore a bright jacket, to suit her bright personality. She was always very good to assemble my small flock in Kilttipper for Holy Communion, at sometime short notice, in between the end of activities and meal time. When I arrived at Foxrock Church I was pleased to see that I knew the Parish Priest and his curate who both had formerly been priests in Tallaght, the ‘singing priest’ Fr Liam Lawton who I had previously met when he was performing in Tallaght and the Garda Chaplain, Joe Kennedy. My sincere condolences again to Audrey’s sister Bernie and the Ruane family. I attended a 80th Birthday celebration Concert for Colin Mawby on Saturday 21st May in St. Ann’s Church the concert was presented by the Friends of Colin Mawby and RTE Lyric FM with former members of the RTE and National Chamber Choirs, Fergal Caulfield & The Leinster Singers performing. 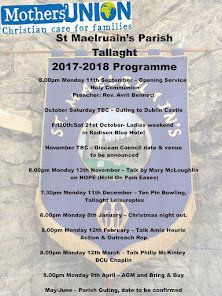 As you know The Leinster Singers (Christmas Concerts) and their director, Ann Feathersone have long been friends with St. Maelruain’s. Colin has visited us in Tallaght many times while The Leinster Singers were performing concerts in the church and I have to admit that I was unaware of the calibre of the musician he is until the evening of his 80th birthday when I learned that Colin had performed his own works for the Queen at St Paul's Cathedral, for President John F. Kennedy at Westminster Cathedral and at St. Peter's Basilica for Pope John Paul II, so we were in honoured company during his visits to us without being aware. May was busy as usual with the run up to the end of ‘term time’, following the launch of the ‘Buddy System’ mission statement in Jobstown Community School myself and school chaplain Paddy Doyle went for a farewell lunch with Alan Morris the departing Pastoral Assistant from An Solas Methodist Church in Jobstown. 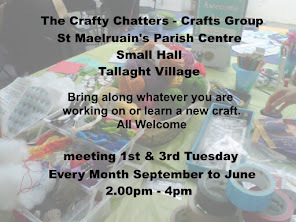 I have enjoyed working with Alan on projects run by the seven ‘Tallaght Churches Together’. We send our best wishes to him and look forward to working with Rev Katherine Keogh in the future. May I take this opportunity to wish all those sitting state exams the very best of luck, a stressful time for all. I hope everybody has an enjoyable summer and long may this lovely weather continue! FUNERAL The funeral of George McKim took place here in Tallaght on Saturday 14th May. We extend our deepest condolences to his wife Suzette, his children Janette, David, Alison & Irene and to the extended family and friends. CONFIRMATION Confirmation service took place on 8th May in Christchurch Cathedral at 3.30pm. The Tallaght candidates were Nathan Hutchinson Edgar, Niamh Ezekwe and Emma Moore. It was a lovely service along with 20 or so candidates from other parishes. It was a beautiful afternoon and it was very pleasant to able to mingle with the young people and their families outside the Cathedral. Please pray for Nathan, Niamh and Emma. MOTHER’S UNION / FAMILIES FIRST Our annual outing this year is a joint Mother’s Union / Parish outing to be held on Saturday 18th June, please see details below. PARISH OUTING Our Parish outing to Tullynally Castle on 18th. June is drawing near. As we have to confirm the numbers by 11th. June, please contact and pay Valerie (086 8594850 ) by this date to secure a place , as the bus is filling quickly. The cost is €55 per person. We will leave the Church at 9.45 sharp, on Saturday 18th June, travel to Tullynally for a tour of the castle and visit the gardens. Refreshments will be served on arrival. We will travel back to the Bloomfield House Hotel in Mullingar that evening for dinner before returning home. The gardens are very accessible with no steps and plenty of opportunities to stop and stop and rest. Tullynally is home to Thomas and Valerie Packenham and and the gardens have species of trees from all around the world. Thomas has written many books on the subject. Let's hope we have a fine day for the trip and that you all enjoy the company and the day out. fought hard and won the trophy for the eleventh time , a record! The ladies trophy, the St. Maelruain's Trophy was one once again this year by Ann O' Sullivan. Well done to you both. Hon. Secretary, Vivienne Bright, Hon. Treasurer. Two committee members are Bobby Wilson and Hilary Cleary. We will reopen late September, date to be advised later. Have a lovely summer everyone. BOYS BRIGADE We had a great and enjoyable display this year. The boys did all their families proud. We had lots of laughs and prizes. Thank you to all who supported the night. A big thank you to all the parents for their commitment throughout the year. We are now finished for the summer and will recommence on 23rd September. We do however have a family fun day planned for the 2nd of July from 11am to 2pm and we would love to see you all there for some more fun and treats. We are also looking for some support for next years start of session, we will be in need of a leader, so if you would like to be apart of our BB team please contact either captains Susan Carroll or Evan McAuly. Wishing you all a lovely summer. WHIST DRIVE The June Whist Drive is on Monday 20th at 8.00pm in the Small Hall. All Welcome! PRAYERS FOR THE PARISH Prayers for the parish have finished for the summer break. 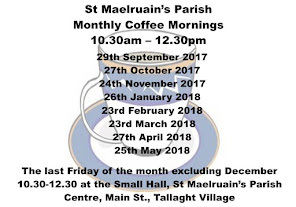 PARISH COFFEE The Coffee Mornings have ended and will resume again in September. We would however, like to send our condolences to Suzette McKim and family on the loss of George. Although he has not been able to attend our meetings of late he will of course be sadly missed. SUMMER SALE We were blessed with glorious weather on the day of our Summer Sale on Saturday 28th May. I think we were up on numbers with a queue of people waiting to enter at 10am! Last year we were lucky to have had a donated first prize therefore taking out the cost of the television the stalls made much the same as last year, thank you to all. 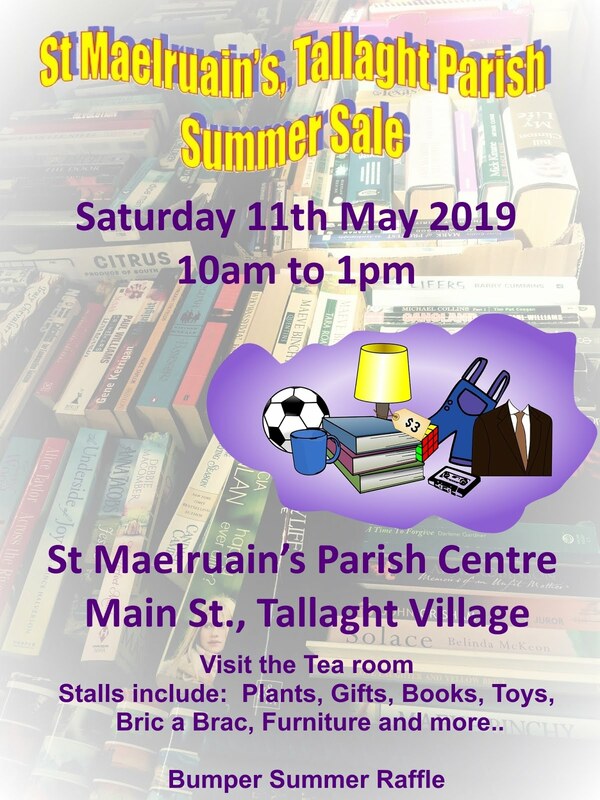 Thank you to Ronnie Scott for coordinating the sale and to all those who helped on the stalls, with the teas and with the setting and clearing up – all your help was very much appreciated. CONCERT The Waterbury Chorale from Connecticut, USA along with Habemus will be having a concert in the church on 28th June at 8pm. They will perform a variety of pieces including contemporary American, Irish traditional, Gospel and Spiritual. It sounds like it’s going to be uplifting! 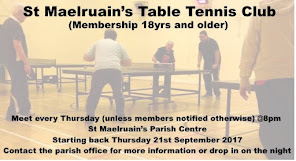 Proceeds will go to the Church restoration fund with a suggested donation of €5 at the door. TALLAFEST Tallafest a Town & Country Fair in the Village & The Priory, organised and run by Tallaght Community Council, will take place this year on Saturday 3rd September, program of events to be announced in July. It always proves to be a fun day for all the family, put the date in your diary! PARISH HALL Our parish is 25 years old this year. We will be celebrating this anniversary on Sunday 25th September with former Rector, Rev’d Robert Kingston coming to preach at the 11am service.